converted it into a fort in 1803. Remember Mission San Antonio de Valero? Known today as The Alamo, this Spanish mission complex was the first of six San Antonio missions founded by Catholic missionaries along the San Antonio River in the early 1700s. The mission was a town and learning center to acculturate the local indigenous people to Christianity and Spanish life. After the mission secularized at the end of the 18th century, Spanish soldiers used the mission church as a fort during Mexico’s fight for independence from Spain. During the Texas Revolution, a small garrison of Texan soldiers died defending The Alamo against the Mexican army. 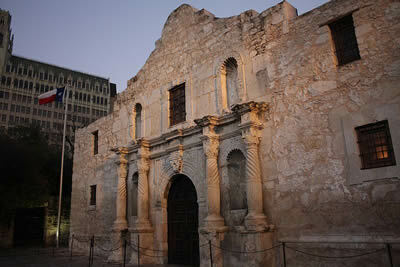 Today, The Alamo, a National Historic Landmark, is located in the heart of downtown San Antonio. In the late 17th century, Spain sent colonists to settle in East Texas to prevent the French from moving into the land west of Louisiana. As they did in other parts of Spanish America, missionaries played an important role in establishing settlements, spreading Spanish culture and Catholicism, and overseeing Spanish interests in Texas. Fray Antonio de Olivares led the Franciscan missionaries who founded the San Antonio de Valero Mission in 1718. The Spanish began construction of the current stone mission complex in 1744. The complex included a chapel, a convento (priest’s residence), small dwellings, storehouses, and workshops. The Franciscan operation there lasted until the end of the century, when Spain closed the mission (secularization). Soon after the mission closed, a company of Spanish Calvary called the Flying Company of San Carlos de Parras arrived and established a fort. The soldiers were from Alamo del Parras in Coahuila, Mexico, and after arrival, the locals began to call the complex “The Alamo.” In 1805, the army built the first European hospital in Texas at the fort. During the Mexican Revolution, the Spanish and the Mexicans fought for control of The Alamo, and the Mexican army occupied the complex between 1821 and 1835. 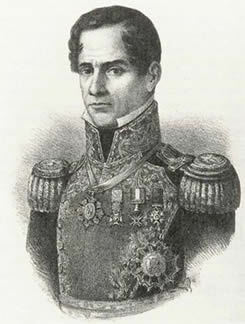 1852 drawing of Mexican General and leader Santa Anna, who led an army of 5,000 soldiers to take the garrison from Texan rebels in 1836. During this period of occupation, the newly independent Republic of Mexico invited foreign immigrants to settle in Texas, which was part of the Mexican State of Coahuila y Tejas. Most were Americans. Some immigrated legally, adopting Mexican culture and Catholicism, but others came illegally. By the end of the 1820s, Anglo American immigrants outnumbered the Mexican population. When the government in Mexico City tried to remove them from Texas and regain control of the region, violence broke out between immigrants and those loyal to Mexico. After a period of mismanagement by the distant Mexican government, Texans of both American and Mexican heritage organized a rebellion in October of 1835 to push out the Mexican government and form the independent Republic of Texas. The Texan rebels took The Alamo in December of 1835 and held it until their defeat in March. In January, the rebels received news that Mexican General Santa Anna was marching north with a large army, but the disorganized Texan government could not get enough reinforcements to the Texan rebels in The Alamo in time. A force of 5,000 Mexican soldiers arrived in San Antonio on February23. Santa Anna’s siege lasted 13 days and he lost 1,544 men in the fighting. By the end, all 187 Texan men garrisoned at The Alamo died defending it against Santa Anna’s attack. The only survivors were a small number of noncombatants, mostly women and children. Of the 187 who died, 13 were native Texans with 11 of the 13 Tejanos, Texans of Mexican descent. Forty-one were born in Europe and the rest were from the United States. Ultimately, the Texas army, which American native Samuel Houston led, won the war and forced Santa Anna to concede Texas to the rebels. In 1845, the United States annexed the Republic of Texas, an act that helped spark the U.S.-Mexican War the following year. After the rebellion, the Republic of Texas handed The Alamo over to the Roman Catholic Church. In 1848, the Church leased the property to the U.S. government. It passed to the Confederacy and then back to the U.S. during the Civil War, and the U.S. government used it for quartermaster’s purposes until 1872. A private citizen purchased the convento from the Church in 1877, and in 1883, the State of Texas bought the chapel. In 1905, the Texas governor acquired the convent and bestowed the entire complex upon the Daughters of the Republic of Texas, who managed the historic site until the early 2010s. Today the site is overseen by the Texas State Land Office. 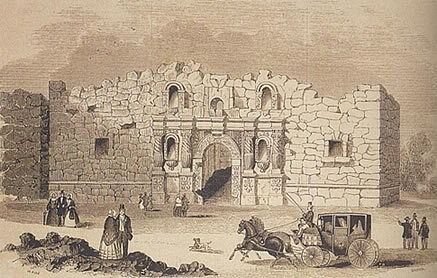 By the mid-19th century, The Alamo was in poor condition. Immediately after construction was complete in 1757, the church had two stone towers flanking the sides of the front façade and a roof with a barrel vault and dome. After five years, these towers and the ceiling collapsed destroying the roof and leaving the building filled with debris. A new church was begun, but never completed – that is what is seen today. By the time of the siege, the property was in poor condition. Located within the restored ruins of the original mission wall, the church of The Alamo is a white stone building, decorated with ornamental stonework on the front façade. The chapel appears much as it did in 1849 when the distinctive parapet was added by the U.S. Army. Its solid masonry is four feet thick, 75 feet long, 62 feet wide, and 22 ½ feet high. Like many Catholic churches, the chapel is cruciform and buttressed on its sidewalls. It would have contained a baptistery, confessional, and sacristy. In 1920, the Daughters of the Republic of Texas put a metal roof over the chapel, replaced the woodwork on the side and rear doors, and replaced the windows. Other restored buildings on the property include two living quarters. The Daughters converted the grounds around the historic buildings into a park in 1936. Continued preservation work ensures the Alamo’s survival. Located in the heart of downtown San Antonio, The Alamo is open to the public year-round. The landscaped mission complex includes exhibits on Texas history, the Daughters of the Republic of Texas Library, the museum shop and gardens. The Alamo staff offer history talks and tours for the public. Other nearby San Antonio historic attractions include San Antonio Missions National Historical Park and the Spanish Governor’s Palace. The Alamo, a National Historic Landmark, is located at 300 Alamo Plaza in downtown San Antonio, TX. Click here for the National Historic Landmark file: text and photos. It is open everyday of the week from 9:00am to 5:30pm, except during June, July, and August when it is open until 7:00pm. The Alamo is closed Dec. 24-25. For more information, visit the The Alamo website or call 210-225-1391. The Alamo and other San Antonio missions are the subjects of an online lesson plan, San Antonio Missions: Spanish Influence in Texas. The lesson plan has been produced by the National Park Service’s Teaching with Historic Places program, which offers a series of online classroom-ready lesson plans on registered historic places. To learn more, visit the Teaching with Historic Places home page. The Alamo has been documented by the National Park Service’s Historic American Buildings Survey. The Alamo is featured in the National Park Service South and West Texas Travel Itinerary.